Leaving home to get back to the Blue Pearl was more challenging than we thought. 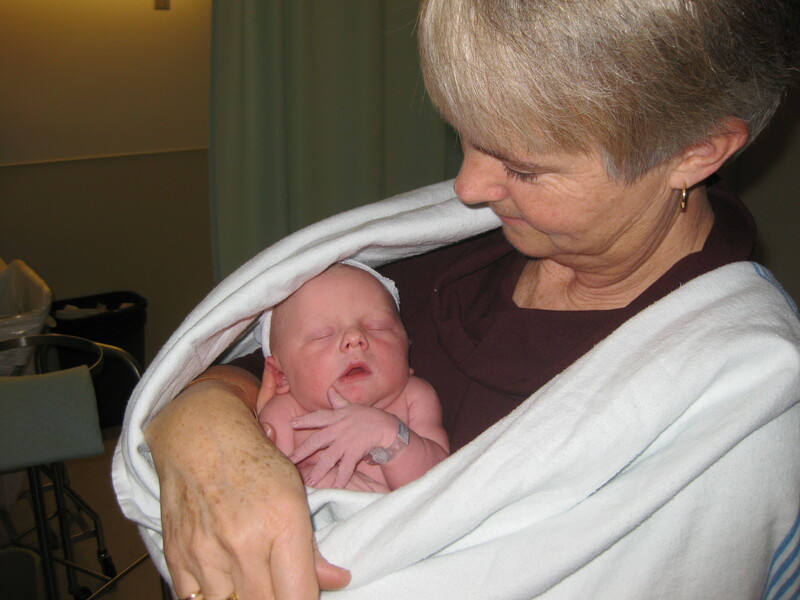 The month leading up to our departure was very emotional – a beautiful new grandson and the end of Glen’s career in education. Jackson David Closs surprised us coming a week early on December 23. (We are excited about a potential visit while we are on the boat in the Bahamas.) Glen went through a range of emotions leaving a job, colleagues and students he loved. It was not as easy as we thought it would be to just pack up and go. But – off we went Thursday, January 7, 2010 to Seattle and Friday to Tampa so Glen could take a course on the Island Packet electrical system on Saturday and Sunday. Sunday was a four and a half hour drive to the boat. An interesting weather development has been overshadowing our departure. Florida has been experiencing record low temperatures for several weeks. It was colder here yesterday than Vancouver ever gets. We stopped at several spots along the way to try to buy a ceramic heater – our boat is built for the Bahamas, not the Arctic – they were sold out at every place we tried. So last night, we slept in our clothes under 3 quilts. It was quite comfy although Pam’s nose was running. This morning Glen found the coveted heater at a local Target so tonight we are warm and cozy. Tomorrow we are having a marine radio installed, we have some boat chores and we are watching the weather. They are forecasting better weather, about 20 C. It looks like we will be off in the next few days for our trip to southern Florida to cross to the Bahamas. 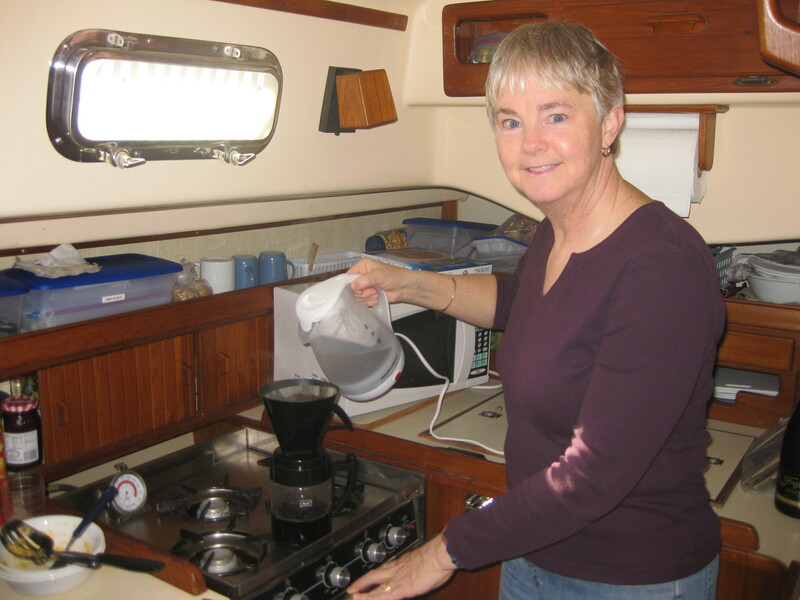 Pam making coffee with our new equipment - Thanks, Pat and Don! We are excited to see your post. Keep blogging we are living vicariously through you. We miss you guys..
Wow! Sure didn't expect Florida to be so cold, that's a nasty surprise. It's so warm right now and pouring rain; all the news is 'Will there be snow for the Olympics?' We got to meet Jackson last Thursday - he sure is a beautiful baby! I'm going over to see dad next week before we head off on our big cruise. Hope the weather smartens up for you! So glad to hear about the new little baby boy in your family and that you are off on your next adventure. I hope the weather reverts back to what it should be (hot, hot, hot) very soon. Welcome back to the warm and sunny South. It's been very COLD down here in Bradenton. We will be heading down to Marathon in Feb, then hopefully over to the Bahamas. Glad to hear the retirement trip has begun. The deep freeze has lifted here in Europe. Record cold temperatures and snowfalls in Birmingham, London, Paris, and Grenoble while we were there. Enjoying the sun now. We look forward to following your journey to the warmth on the blog.